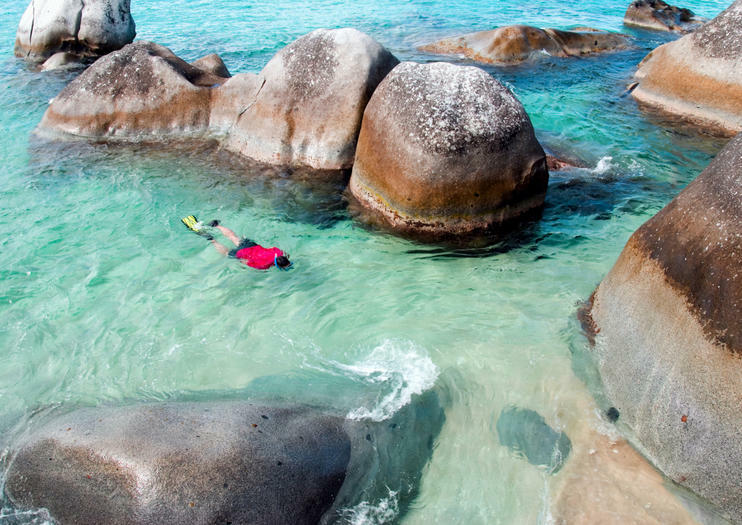 One of the smaller snorkel spots in St John, Whistling Cay is only accessible by boat, and with its depths of 40 feet or more, it is considered a deep-water snorkeling area. The clear waters allow visitors to see down into the deep to see large coral formations; they can either snorkel the surface and admire the coral from afar or free-dive down to explore them up close. This prime spot means that snorkelers often spot large fish such as tarpon, uncommon at shallower snorkeling spots. Whistling Cay is located off the north shore of St. John, near Mary Cay. The island has small pebble beaches on the east side, while larger cobblestone beaches are commonplace on the western side. There is an old stone structure on the east side of the small island that is commonly referred to as the “Old Customs House.” Some do not believe it is in fact the old customs house for St. John given its location, and it has been suggested that perhaps it was once an old guard house in the 1800s when slavery was abolished in the British Virgin Islands. Because slavery was still continuing in the Danish West Indies, slaves along St John’s north coast were trying to escape to nearby Tortola. In between Whistling Cay and St John is the Fungi Passage, where you can find prime snorkeling. Be cautious, however, about venturing too far out since boats do use this area. The flow of water through the Fungi Passage attracts a wide variety of colorful fish, and the underwater landscape with its deep canyons, steep grooves and rock formations is home to coral, sponges and tunicate. Whistling Cay is only accesible by private boat, kayak or boat tour. Be advised that this area may see choppy days due to its location and that it is considered an intermediate dive spot. There are no facilities on Whistling Cay.